I drove to Arcosanti in January, having heard about his blending of architecture and ecology into the new term of arcology, finding form as a sustainable urban habitat in the desert. Arcosanti is architect Paolo Soleri’s urban experiment that combines the comforts of urban living into an efficient city that celebrates sustainability. The desert city of Arcosanti faces the south and is etched into the hillside. Arcosanti is located outside of Cordes Junction, in Arizona. Paolo Soleri is an architectural visionary, seeking to solve the problems associated with urban sprawl and its resulting social decay. He saw that society had become more isolated from the natural world and proposed numerous solutions to design the community back into the core of the city, while using less resources, increasing efficiency and utilizing open space to nurture an appreciation of one’s surrounding natural habitat. The Visitor’s Center from the south as it faces the canyon. I arrived to Arcosanti early in the morning, and as the Visitor’s Center had not yet opened, I took a walk down a dirt road. Not knowing where it led, as I rounded a corner, I was faced with a massive 5 story building accompanied by the sound of bells chiming in the wind. I felt small as I walked toward a futuristic fortress-looking building with its large glass windows looking down on me. Arcosanti is a city prototype that will one day sustain and house up to 5,000 people. While the living areas and cities are quite compact, it borders a 3,200 acre preserve. The cafeteria is filled with light and has a gorgeous view out the large windows. The five story building that houses the Visitor’s Center, bakery, cafe and offices is an exquisite blend of the contrasting terms of mass and tremendous weight to with light filled spaces that nurture and a sense of weightlessness. This concrete building style is typical of all the buildings throughout the city. A fan located at the top of the orange heat sleeve transfers the warm air that collects at the top of the building into the space below. The Visitor’s Center is also a passive solar building and does not have an external heating or cooling source. Notice how the sunlight enters through the large southern facing window. The sun’s heat is absorbed into the tile floor, a material with thermal mass that slowly radiates the heat back into the space. 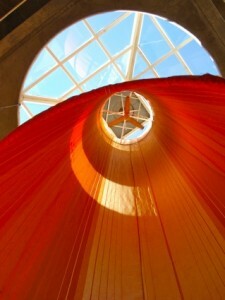 The orange sleeve that can be seen on the left hand side of the picture pushes warm air collected at the top of the building into the space below. Paolo Soleri’s bells chime to welcome to the visitor. Paolo Soleri is renaissance ideal, being a prolific writer, designer, architect and artist. He has penned numerous books, designed and built bridges, amphitheaters and buildings, and started the Cosanti Foundation. His bronze and ceramic bells are made at Arcosanti. 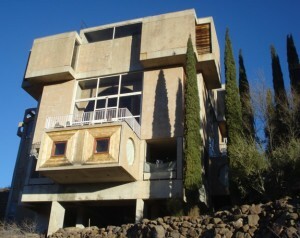 Soleri’s Cosanti property, located in Paradise Valley, Arizona, also makes bronze bells. 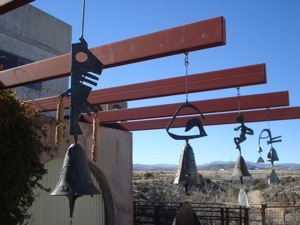 The sales of these bells help to support the building efforts at Arcosanti. Passive Solar elements design allows the winter sun to warm a work area. The bells are made in the foundry, an area shielded by a half dome that creates a configuration that allows work to take place in the open air. The foundry also feature passive solar elements. Because it is located in the high desert of Arizona, it can get mighty hot in the summertime. Because the entire city faces the house, Soleri designed Arcosanti to take advantage of this. This picture was taken in January, close to the winter solstice. In the cooler winter months, the winter sun warms the area and its heat is absorbed into the thermal mass of the concrete. In the summertime, the high winter sun does not enter into the domed area and the foundry is shaded and keeps the working area cooler. White lines painted on the floor under the domes mark where the sun enters at certain times of the year. Passive solar building relies on basic scientific principals that have been used throughout time. Notable historical examples are evidenced by the Anasazi Cliff Dwellers and the ancient Greeks. Soleri designed the city to have areas of public, shared community space along with with private living areas. A public, shared space can be seen under two large concrete domes. There are also a couple of chairs and children’s toys in this area. White lines have been painted on the floor under the domes that is indicative of how far the sun enters the domes on the the winter and summer solstice as well as on spring and fall equinoxes. Paolo Soleri believes in the integration of passive and active solar elements to make sustainable cities. Soleri believes in the combination of both passive and active solar elements create the ideal urban environment. These principals can be seen in action throughout Arcosanti. All of the active solar photovoltaic panels incorporated into the build supply about 10 percent of the energy that the community uses. Public and private spaces were intermingled throughout the development. The intermingling of public and private areas can be seen in the amphitheater. People in the community have their own private living areas, while having opportunities to actively engage with the community. The amphitheater is a half circle around the stage, while apartment buildings surround the amphitheater. This type of community contrasts with the notion of suburbia and neighborhoods of residential areas where people must travel outside of the neighborhood to grocery stores, restaurants and entertainment. A water faucet is tucked away under the seating to provide water for the plants. 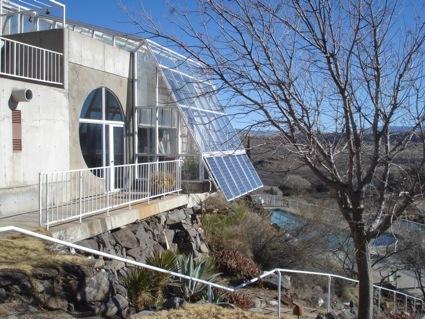 There are many different resource saving elements built in throughout Arcosanti. Water from the roof is channeled into and collected in a cistern. 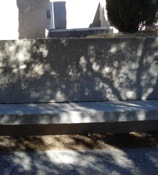 That water is accessed by a water faucet that can be seen close to the sidewalk, under the seating area. (Look at the brown strip in the lower 1/5 of the picture and see the faucet located just above it in the middle.) A water hose is attached to utilize the water for the plants and trees. I continued to explore and came upon a trail marked as a “Visitor’s Trail” that led into the canyon. I walked to an overlook across from Arcosanti and was faced with a futuristic city, composed of many buildings and areas. Sounds of workers and music from the radio wafted toward me and mixed with the sounds of small animals scurrying and birds fluttering to different bushes. 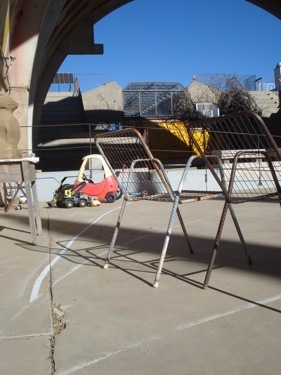 There is work being done on the lower section of Arcosanti on guest housing. Construction on Arcosanti started in the 1970s and continues today. Work is currently being done in front of the guest housing on a large terraced greenhouse. An artist rendering of Paolo Soleri, by Simtropolitan, contributor to Wikipedia. Mr. Soleri envisioned and drafted the plans for many different types of large, sustainable cities that could support thousands of residents. He designed all his cities to incorporate the good aspects of the city, (good food, community leisure and entertainment) while preserving the tranquility and importance of private spaces with the goal of living more efficiently and sustainably. He is a creative visionary. 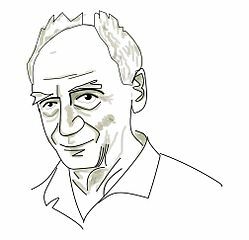 Currently, there are mixed use, urban developments are going in the direction of mixed use environment, such as TAXI, outside of Denver, but not to the extent of sustainability that Paolo Soleri envisions. There is also one major sustainable solar city development that is being built in the UAE called Masdar, to be completed in 2025. 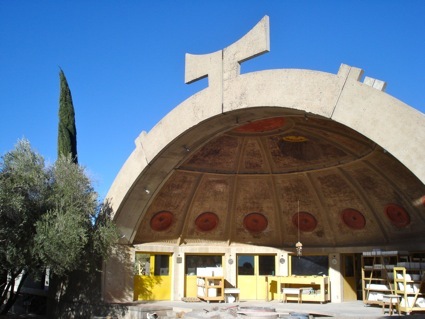 Arcosanti is located at exit 262, Cordes Junction on I-17, in Arizona. Arcosanti is a beautiful urban development with sustainability, modern design and community at its core. We need to have more of these types of developments. There is active industry there with the building of bells within on-site foundries, making both clay and bronze bells. When I visited, there were about 60 residents living there in the winter. 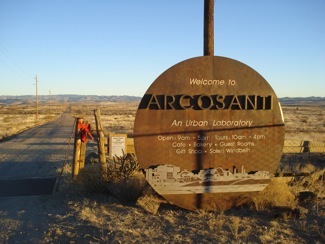 While Arcosanti is located a short distance from the Interstate, it imbues a different, futuristic, progressive feel, making the interstate feel as through it was a relic from an older era. 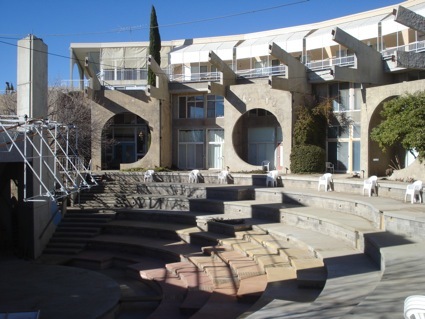 Arcosanti is open to the public and offers tours, retreats, workshops and summer concerts. 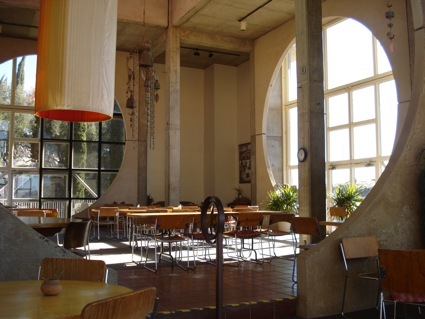 You can also reserve a room at Arcosanti and enjoy baked delights and food in the cafeteria. It’s a great place to visit, find inspiration and be thankful for the good people in the world. Paolo Soleri recently passed away at the age of 93. He leaves a legacy of beauty within his many creations.